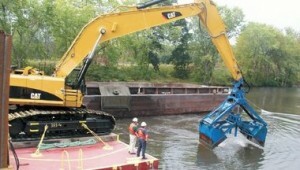 The second phase of the cleanup in the Upper Hudson River that started in 2009 is approaching completion. However, the cleanup does not adequately address areas that require navigational dredging, which is needed to allow larger commercial vessels full use of the river. Clearwater is calling on GE to agree to work with the NYS Canal Corporation and the Federal Natural Resource Damage Trustees to be sure the Hudson River is restored to its full potential. More than 60 communities and groups have adopted a resolution urging GE to finish the job. Despite GE’s progress, 136 acres of contaminated sediment are outside the delineated dredging area and will remain un-remediated unless an agreement is reached with GE. Many studies have confirmed that PCB removal is the best solution to ensuring that the river will recover as a vigorous natural and economic resource for Hudson River Valley and New York State. In addition, under Superfund, a parallel process of restoration has now begun to assess the impacts to natural resources. Restoration is different from remediation and refers to returning the environment to, as closely as possible, its original condition. This work will be carried out as part of the Natural Resource Damage Assessment (NRDA) by the NRD Trustees, which include members from the NYS Department of Environmental Conservation, US Fish and Wildlife Service, and National Oceanic and Atmospheric Administration, who will provide oversight in analyzing injury, evaluating restoration projects, and matching those projects to the injuries. Clearwater has actively participated in the Community Advisory Group (CAG) on an ongoing basis and is currently utilizing a $50,000 EPA Technical Assistance Grant (TAG) to help bring good science to answer questions from community members, municipal leaders, and the media and to address important issues and concerns. Clearwater and our partners continue to monitor the progress along with any outstanding problems in the ongoing effort to assure a world-class clean-up of Hudson River PCBs. April 2015Report from the Hudson River Natural Resource Trustees: Injuries to Hudson River Fisher Resources: Fishery Closures and Consumption Restriction. The 2014 Hudson River PCB Forum took place November 11 at Marist College. Click here for a copy of the agenda. Sample Resolution Regarding the Removal of PCBs from the Hudson River. Click here for an overview and reports from the January 16, 2013 Hudson River PCB Forum – Project Update and Looking to the Future.